Stuart Simpson's DRAGON FORCE X Arrives Monday! It was back in August that we wrote about a crowdfunding campaign for writer-director-star Stuart Simpson's upcoming web series Dragon Force X. And that campaign was clearly successful because the series is now wrapped up and set to arrive at Cult Of Monster on Monday! In a seedy underworld of scum and villainy, where magic and wonder have been perverted by greed and a lust for power, assassin-for-hire Maddox Montana travels across strange and exotic lands in search of the Amulets of Fire, an ancient mystical force with the power to change reality. Desired by many, worthy of few, what begins as just another job turns into the adventure of a lifetime for Maddox and his gang of misfits, as they discover the full power and glory of Dragon Force X. This deliberate throwback to the cult kung fu fantasy inspired films of DTV's golden (?) era looks like an absolute blast! Check out the trailer below and be keeping an eye out for the arrival of the first episode! Crowdfund This! 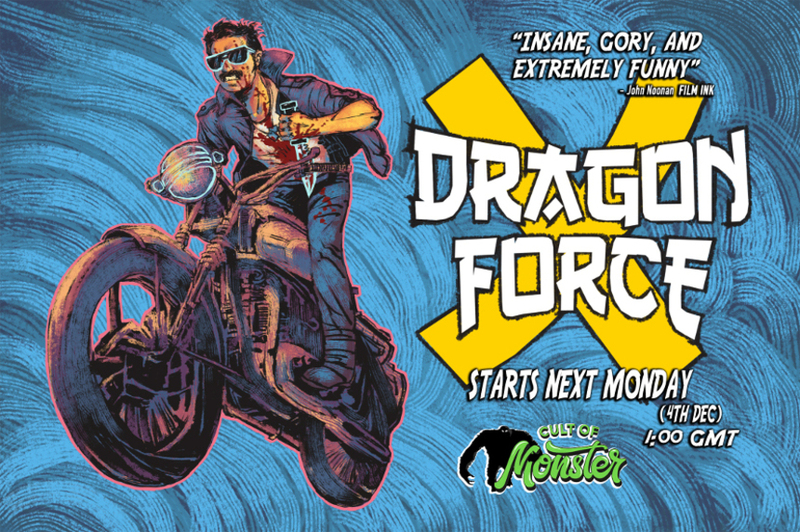 DRAGON FORCE X Delivers Kung Fu And Kick-Arse Moustaches!